A very tricky parasite has recently been discovered. What makes it so sneaky? After infecting a certain species of ant known as Cephalotes atratus, the parasitic nematode triggers changes in the ant’s abdomen, which then becomes red and swells. This bulging, red appearance resembles a berry. Birds who feed on this type of fruit mistake the ant for a berry, swoop in and gulp! The bird swallows the ant, which allows the parasite to now infect the bird. Once birds are infected, the parasite can spread through the birds’ feces. In a bizarre circle of events, the ants round off the infectious cycle by gathering up the birds’ droppings so that they – along with their young – can feed off the feces. Smart parasite! It manages to sustain itself through the host ant so it can infect the unsuspecting birds – who think they’re about to eat a juicy, luscious berry! Credit: Steve Yanoviak of the University of Arkansas. 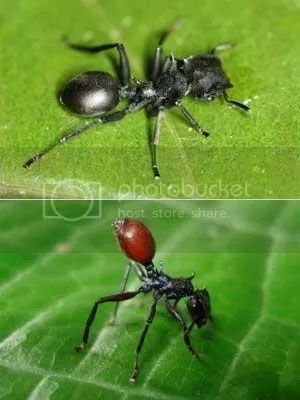 Check out the normal worker ant in the top picture and then compare it to the picture below it, which shows an ant infected with a parasitic nematode. That is one seriously red abdomen! It will be the doom of the ant when a bird mistakes it for a yummy, red berry. It’s just crazy that something as dumb as a nematode can manipulate its host’s exterior morphology and behavior in ways sufficient to convince a clever bird to facilitate transmission of the nematode. It’s phenomenal that these nematodes actually turn the ants bright red and that they look so much like the fruits in the forest canopy. The full article describing the fruit mimicry will be published later this year in the journal American Naturalist. 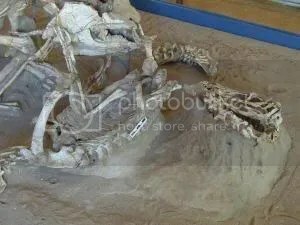 It might be worth a wee read to get the entire scoop on this amazing discovery. Also, research like this doesn’t go without funding – it was partially supported by the National Geographic Society, Amazon Conservation Association and the BBC Natural History Unit. I’m absolutely amazed at the findings. It’s incredible that something as seemingly simple as a nematode can manipulate the ants in such a successful way. It just goes to show that whether a creature is simple or complex, evolution can be one smart cookie!